Overview: With its signature brownstone Victorian homes, Back Bay is one of Boston's most iconic neighborhoods. From cultural hubs like Newbury Street and The Prudential Center to beautiful parks like The Commonwealth Avenue Mall, this area has so much to offer. Location: Back Bay is located in the heart of Boston along The Charles River. There are several MBTA stations here, including, the Green Line's Copley, Convention Center and Arlington stations. Back Bay is surrounded by the following neighborhoods: Fenway/Kenmore, the South End, and Beacon Hill. 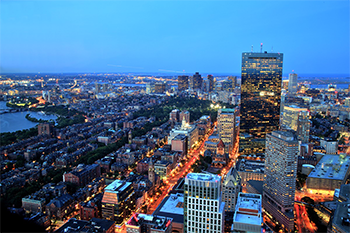 Culture: Back Bay has a vibrant atmosphere with great shopping, beautiful parks, and many popular bars and restaurants. Notable Places: Newbury Street, Prudential Center, Copley Square, Copley Place, Boston Public Library, The Charles River Esplanade. Below, explore luxury homes for sale in Boston's Back Bay neighborhood. Be sure to register an account so that you have the ability to save your favorite listings and get notifications when similar properties enter the market. You can also search all Boston real estate using our advanced search tool. Spacious Studio w/ Shiny HWF, Modern Updates. Nicely refinished kitchenette. Updated bathroom with ceramic tile. Gleaming hardwoods. Amazing Back Bay location! The perfect place to come home to after a long day at school, work, or a long night on the town. Close to Hynes T stop (Greenline) and the #1 Bus. Short walk to Newbury Street, Prudential Center, Copley Square, Boston Common and the Boston Public Gardens. Parking Available Behind the Building. Brand New Laundry Center in Building! I have a question about the property at 506 Beacon Street Boston MA 02215 (#72450737). I would like to schedule a visit for the property at 506 Beacon Street Boston MA 02215 (#72450737). Bright top floor studio overlooking Newbury Street! Hardwood floors throughout, large windows. kitchenette with compact fridge and countertop range, bathroom with tub. Beautiful Newbury Street brownstone with recently renovated common areas. Management office is located on the first floor. One block from Green Line T-stop and #1 bus stop. Short walk to grocery stores, the Prudential Center, Charles River and a variety of fine shops and restaurants. I have a question about the property at 302 Newbury Street Boston MA 02215 (#72473072). I would like to schedule a visit for the property at 302 Newbury Street Boston MA 02215 (#72473072). This is a PARKING SPACE, not an APARTMENT! One parking space is available now at the back of 339 Commonwealth. It belongs to a tandem parking space shared with another unit. This space is at the back. I have a question about the property at 339 Commonwealth Avenue Boston MA 02115 (#72478659). I would like to schedule a visit for the property at 339 Commonwealth Avenue Boston MA 02115 (#72478659). I have a question about the property at 755 Boylston Street Boston MA 02116 (#72431471). I would like to schedule a visit for the property at 755 Boylston Street Boston MA 02116 (#72431471). Location! Location!Location! Rare opportunity for retail store front in sought after Back Bay, heart of Boston! A++ prime location, between Marlborough St and Commonwealth Ave., within walking distance to Newbury St,Commonwealth Park, MIT, Boston University, Berklee College of Music and Charles River. Close to Northeastern University. Used to be a cupcake store. Priced at $75/SF, NNN. I have a question about the property at 49 Massachusetts Avenue Boston MA 02115 (#72440259). I would like to schedule a visit for the property at 49 Massachusetts Avenue Boston MA 02115 (#72440259). Excellent opportunity to have your office in the heart of Boston's Back Bay. Located on the first block of Boylston Street and steps away from the World Famous Boston Public Garden & Boston Common. This is one of the most sought after locations In Boston to have your office. This Iconic office & retail building has just finished improvements that include Venetian Plastered walls, all new carpet & paint in the common areas. The office space is for Lease & located on the 5th floor with front, back and side facing facing. Excellent front facing view of Boylston Street. A flexible floor plan with multiple private offices / conference rooms and open work space.Central air conditioning, sleek & shiny hardwood floors. Turn Key! Building has 1 elevator.Minutes walk to public transportation green line, multiple garage parking options close by and easy access to Logan International Airport, The Mass Pike & all major highways. I have a question about the property at 376 Boylston Boston MA 02116 (#72429929). I would like to schedule a visit for the property at 376 Boylston Boston MA 02116 (#72429929). I have a question about the property at 321 Newbury Street Boston MA 02116 (#72357477). I would like to schedule a visit for the property at 321 Newbury Street Boston MA 02116 (#72357477). This 11,287 SF building is conveniently located between Fairfield and Gloucester Streets. 275 Newbury offers users an unprecedented opportunity to occupy between ± 1,234-3,797 square feet over 2 levels with full floor open layouts and rare four sides of windows. Convenient access to plentiful retail, restaurants and specialty stores along with an abundance of parking options within walking distance make this a unique chance to occupy prime office space on Boston's most prestigious street. I have a question about the property at 275 Newbury Street Boston MA 02116 (#72304674). I would like to schedule a visit for the property at 275 Newbury Street Boston MA 02116 (#72304674). Excellent opportunity to have your office in the heart of Boston's Back Bay. Located on Boylston Street at the corner of Exeter Street and steps away from the Prudential Center & Copley Square. This is one of the most sought after locations In Boston to have your office.The office space is for Lease & located on the 6th floor and takes up the entire floor with front & side facing views from the wall of windows offering commanding views of Boylston Street & The Back Bay Skyline. The space is completely raw with towering ceiling height. A blank canvass. Bring your ideas to have a custom build out. Building offers a gorgeous renovated front lobby,central air conditioning & direct elevator access. Minutes walk to public transportation green line, multiple garage parking options close by and easy access to Logan International Airport, The Mass Pike & all major highways. I have a question about the property at 711 Boylston Street Boston MA 02116 (#72378793). I would like to schedule a visit for the property at 711 Boylston Street Boston MA 02116 (#72378793). I have a question about the property at 39-45 Newbury Street Boston MA 02116 (#72304189). I would like to schedule a visit for the property at 39-45 Newbury Street Boston MA 02116 (#72304189).